Shin Sen Gumi opened a branch of their popular Hakata ramen shop in Little Tokyo while I was holidaying in Vietnam. I had heard rumblings from fellow ramen-goers that the noodles here were comparable to Daikokuya without the hour-long wait, so I rushed over just as soon as the jet lag wore off to taste them for myself. 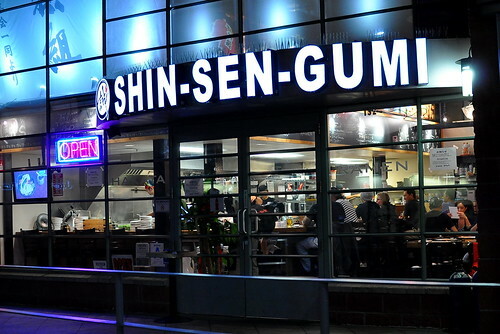 This is the Shin Sen Gumi Group’s fourth Hakata ramen outlet in Los Angeles. The other three locations are in Gardena, Rosemead, and Fountain Valley. 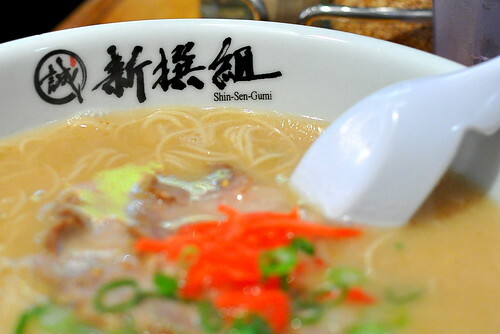 Shin Sen Gumi specializes in Hakata-style ramen from northwestern Kyushu. 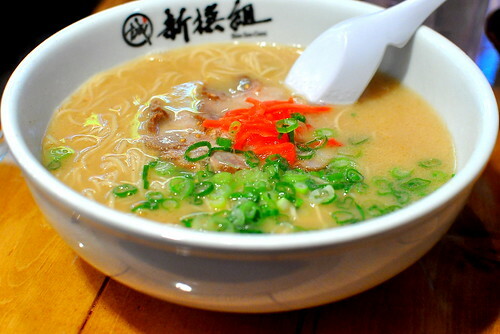 This type of ramen is characterized by a thick, pork bone-based soup (tonkotsu) paired with thin, straight noodles. 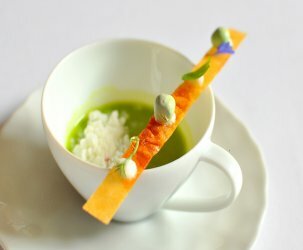 The restaurant simmers Berkshire pork bones for fifteen hours to achieve a rich and luscious broth. 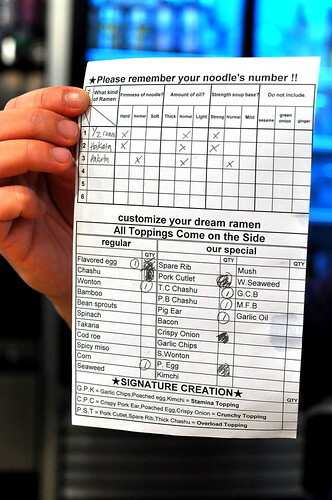 At Shin Sen Gumi, ramen is served in accordance to diners’ preferences. 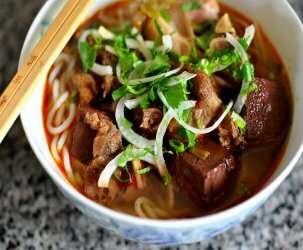 From the doneness of the noodles to the thickness and richness of the soup, my dining companions and I were able to specify exactly how we liked our bowls. My cousin Phil and I chose “hard” noodles, “normal” oil, and a “strong” soup base, while The Astronomer went for “normal” across the board. 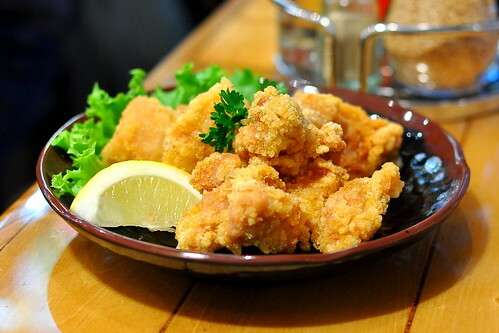 Before the slurping commenced, we shared an order of the chicken karaage. The nuggets were freshly fried and served with a lemon wedge and a mayonnaise-based dipping sauce. It was a solid starter while waiting for our noodles to arrive. I was also interested in sampling the gyozas, but was advised against it by fellow blogger Darin Dines. It turns out that they’re scrawny little things that aren’t worth my while. 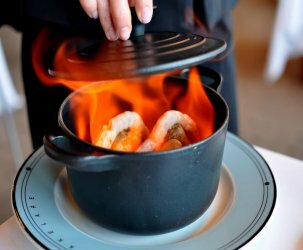 Our main courses arrived midway through the appetizer. 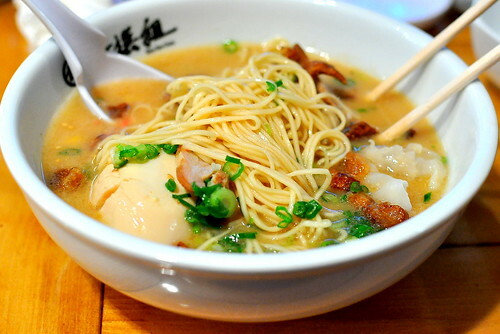 Every bowl of ramen comes with two slices of chashu, a smattering of scallions, and a bit of pickled ginger. A wide array of additional toppings are available for a small fee each. 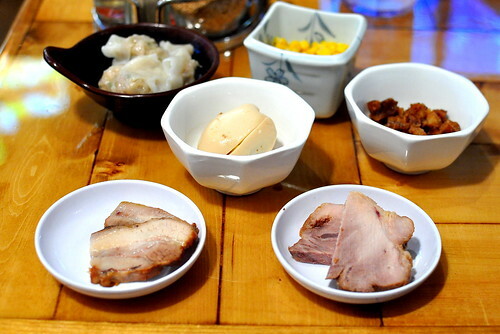 Our party of three ordered wontons, corn, fried pig’s ears, “flavored egg,” pork belly, and extra chashu to add to our bowls. I was initially not too keen on the super-crispy pig’s ears, but after they softened and mellowed out in the broth, they ended up adding a great textural contrast to the bowl. The pork belly and hard-boiled egg were worthy of reordering on future visits. My custom bowl of noodles came exactly as I specified, with “hard” noodles, “normal” oil, and a “strong” soup base. I loved how the noodles had a definite bite to them, while the broth was thoroughly porky and just salty enough. It was a great bowl of ramen all around. The Astronomer enjoyed his bowl as well and even ordered an additional heap of noodles (kaedama) after he polished off the first. 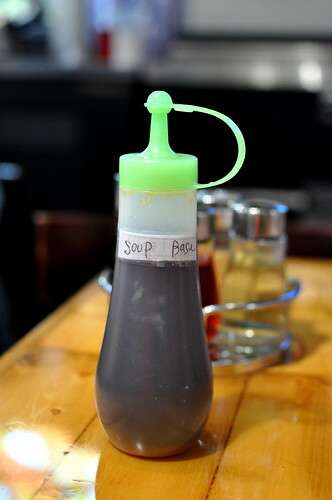 It arrived along with a squeeze bottle filled with “soup base” to adjust the seasonings. While I enjoyed my Shin Sen Gumi experience very much, I can’t say that it has replaced the neighborhood’s reigning ramen darling for me. Ramen-wise, Daikokuya and Shin Sen Gumi are on par with one another, but when it comes to ambiance and extras (i.e. gyozas, prices, combination meals, etc. ), Daikokuya has a leg up. I’m all about the extras. Just made my fourth trip here today! I would have to agree that the “extras” at Daikokuya are superior – I especially love the fried rice, pork belly bowl and gyoza. SSG, cutest name in the world, but I’m a lover of Santouka. (Though I do favor the “extras” at Daikokuya — fried rice, gyoza, et al.) also, adored the bowl at Ton-Chan Ramen, JINYA, and … Ippudo in NYC. there is something about the garlic paste at daikokuya that i love.